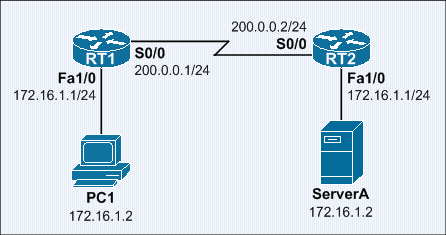 Both RT1 and RT2 have an overlapping subnet of 172.16.1.0/24. RT1 is configured to perform the Twice NAT operation. PC1 will view ServerA as 11.0.0.2 (outside local); while ServerA will view PC1 as 10.0.0.2 (inside global). Below show the command output and ICMP debug message when RT1 pings RT2’s 172.16.1.1 (appeared as 11.0.0.1) using its own IP address of 172.16.1.1. Below show the command output and ICMP debug message when ServerA pings PC1. Below shows the IP NAT translation table on RT1 after the ICMP ping operations above. Note: The icmp NAT entry is only being created when RT1 initiates an ICMP ping to 10.0.0.0/24.